Our Supersafe National Parks Quarters Albums are the perfect way to preserve and display these great new coins. Our albums allow you to view both sides of each coin. 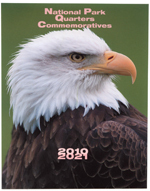 Two versions are available with the NPQ56 holding 1 of each State Park and the NPQ112 with spaces for both Denver and Philadelphia Mint versions. Start collecting this great series today!